New York-born author, tax accountant and financial commentator, Marc Nonnenkamp holds an MBA degree in Corporate Finance, and so is eminently qualified to critically examine the fiscal health of some of the world’s largest companies. With a background in banking, and being a motoring enthusiast, meant that it would not be long before the global automotive giants attracted Nonnenkamp’s attention, and his latest book, VOLKSWAGEN: A CAR FOR THE PEOPLE – A SUCCESS STORY, has brought the Wolfsburg manufacturer under the spotlight. Production of the Volkswagen Beetle, which was born during the troubled years just prior to World War II, was halted for much of the 1940s to be resurrected only towards the end of that decade. It is perhaps ironic that popularity of the iconic car then increased to such an extent that it went on to become the highest production vehicle of all time. Through the decades since those early days, the Volkswagen company has grown, not unexpectedly, into one of the largest vehicle producers in the world with a reputation for delivering not only good value for money, but also high quality products. A manufacturer does not build such a wide and firm foundation for growth without investing heavily in quality of engineering and it is possibly this factor, which above all else, has ensured the company’s continued growth and popularity among its customers. But there are hundreds of books written on the famous Beetle and indeed all of Volkswagen’s much-loved range of products, so why do we need another book on this company and its cars? The answer is quite simply because the reader, along with Volkswagen’s millions of customers, are still hungry to know more about this manufacturing giant. Nonnenkamp’s book, however, does not focus on the range of products, detailing yet again the technical specifications, performance and production figures, but instead it looks at the company and how the range of products, the quality of engineering and production planning has ensured that this manufacturing giant has continued to grow during quite possibly the most difficult economic conditions since those uncertain days of the Beetle’s troubled birth. It quickly becomes evident that not only does Nonnenkamp have an in-depth knowledge of the motor industry as a whole and the Volkswagen Group in particular, but he has also done his homework very thoroughly as he has woven into the story well-researched facts concerning the key players in the company from the early days up to present. He has also listed the other main manufacturers and outlined their market positions, giving the reader much to chew on. 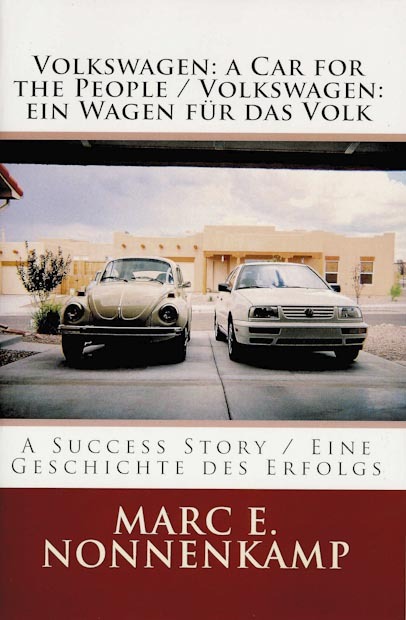 Explaining the background of key people, their positions in society and in the various companies, provides the reader with much needed information to help them understand the somewhat complex landscape in which the Volkswagen was conceived. This makes for fascinating reading and Nonnenkamp’s skill in simplifying this web of relationships is refreshing. Engineering, engineering, engineering – throughout the book, Nonnenkamp emphasises that Volkswagen’s foundational strength lies in its engineering excellence, an ingredient that has been sadly overlooked or is even well down the list of priorities in some of this company’s main competitors. The author lists production figures, marketing statistics and financial results, showing how the Volkswagen Group has become the most profitable automotive manufacturer today and indeed one of the most successful companies in the world. Towards the back of the book the author has compiled a brief history of the automotive brands around the world, who owns them and when those dormant brands stopped production. This is an extremely useful record as once great names have been sold, merged, taken over or just left to lie dormant, and Nonnenkamp’s research reminds the reader of just how much the automotive landscape has changed over the decades. The book is a must for anyone interested in the VW brand and makes for fascinating reading if the auto industry is your thing. The dual-language layout (English/German) makes following the thread of the story a little difficult, but this is a personal dislike and it may not be a problem for other readers. One other criticism, albeit a small one, is perhaps the limited number of images, but the content, research and writing style more than make up for this. Marc Nonnenkamp, a self-confessed VW aficionado, lives in Sante Fe, New Mexico and is the author of eight books.